Earnings HQ: FBN’s Ashley Webster breaks down United Parcel Service’s first-quarter earnings report. United Parcel Service Inc on Tuesday reported a higher quarterly net profit due to price increases and productivity improvements, and reaffirmed its earnings outlook for 2015. Atlanta-based UPS said profitability had improved across all of its business segments in the first quarter, though revenue growth in its supply chain and freight business was slowed by a strong U.S. dollar and lower fuel surcharges. The world&apos;s largest package delivery company posted a first-quarter net profit of $1.03 billion, or $1.12 per share, up 10 percent from $911 million, or 98 cents per share, a year earlier. Analysts had expected earnings per share of $1.09 for the quarter. UPS posted revenue of $14 billion, below the $14.3 billion that Wall Street analysts had expected. The company said it continues to expect earnings per share of between $5.05 and $5.30 for 2015. Analysts have predicted earnings per share of $5.15 for the year. UPS&apos; first-quarter profit beat came after a difficult fourth quarter in which the company overspent in preparation for a holiday peak season package surge that failed to materialize. Earlier this month, its main rival, FedEx Corp, announced it would buy Dutch package delivery firm TNT Express . 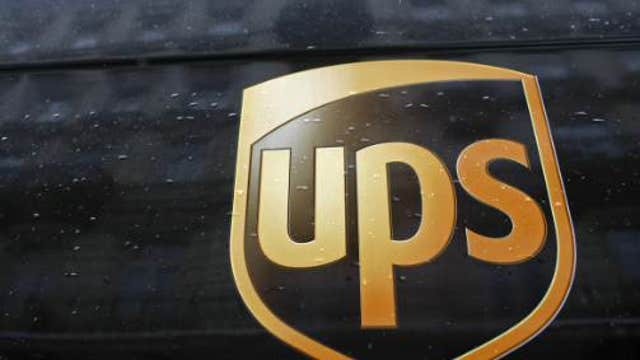 A 2013 UPS bid to buy TNT was blocked by regulators. If FedEx&apos;s acquisition of TNT is approved, it would become the second largest package delivery firm in Europe after Deutsche Post&apos;s DHL, knocking UPS into third place. UPS said revenue at its key domestic U.S. package service rose to $8.8 billion in the first quarter, up 3.5 percent from $8.5 billion in the year-ago period. Revenue per package rose 1.3 percent, aided by a change in "dimensional weight pricing." The new pricing system, which FedEx has introduced, punishes e-commerce vendors for using excessive packaging for small items and taking up too much space on package delivery vehicles.